Lavender scones and lavender latte, need I say more! 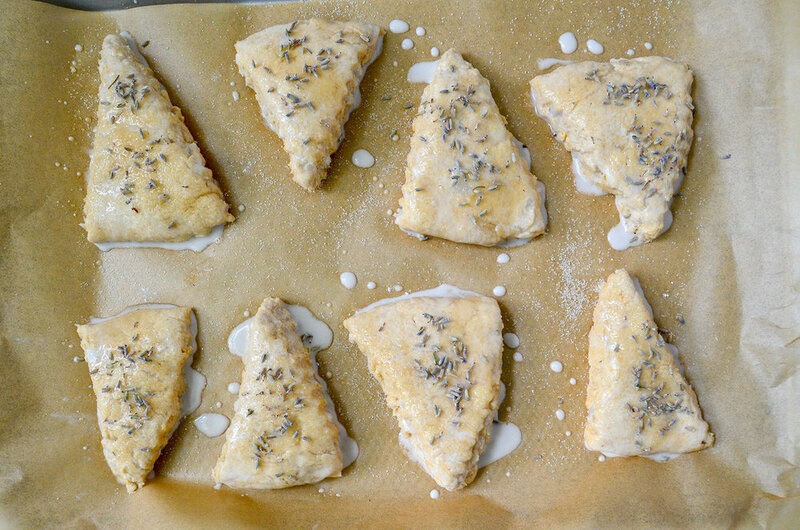 Lavender scones are flaky and buttery without the guilt. Lavender latte made with lavender-infused coconut milk that is sure to wake you in the best way! I’m not quite sure why I don’t make scones enough. They’re super easy to make, with simple ingredients, and they taste amazing! Let me show you how! I have tried many lavender baked goods in my time and what I have found is that it is too easy to use too much lavender! It seems as though the flavor is overpowering, “soapy” tasting, or just nonexistent. The best way to use lavender is to use it sparingly so it adds the perfect hint of flavor and aroma. In this recipe, I simply infuse the milk with the dried buds, resulting in just the right amount of the lavender flavor. On the subject, it is best to cook with dried culinary lavender rather than fresh. I love using lavender for many uses so I purchase this bulk dried lavender brand from Amazon. The next thing you need to know is that scones are not like most pastries. The dough doesn’t require a lot of kneading and doesn’t need to rise. Actually, the less you mess with the dough the better! These lavender scones are healthier than the typical scone as some of the classic main ingredients are swapped for healthier options. For example, a scone cannot be a flaky, buttery scone without cold cubed butter. I have tried this recipe with cold vegan butter but what I have found to be healthier and actually better tasting is using cold coconut oil. I also use 100% stone ground whole wheat pastry organic flour which I have found is the best base for this scone. Bob’s Red Mill brand is what I use for this recipe. Before putting the scones in the oven, you’ll need to use your leftover infused lavender milk mixture and brush the mixture over the top of each scone. Sprinkle coarse sugar on top and dried lavender to pretty them up! The lavender milk and sugar will help create a crunchy outer layer which pairs great with the flakey, butteriness of the scones. If you have leftover lavender milk mixture, why not make a lavender latte to pair with your scone!? It's super easy -- just add some to your choice of coffee! You really don’t need a glaze for these scones as they stand on their own but if you must, I love drizzling honey over them. If you have been following me on Instagram, you’ll see that I love putting lavender honey over my scones to take it to the next level. Savannah Bee Company is what I use! *In a small saucepan, combine coconut milk, vanilla, and lavender flowers and heat until boiling. Just when the mixture boils and the lavender is fragrant, turn the burner off and let steep for about 10 minutes. Strain the mixture using a fine strainer and let cool to room temperature. In a large mixing bowl, whisk together flour, powder, salt, and sugar. 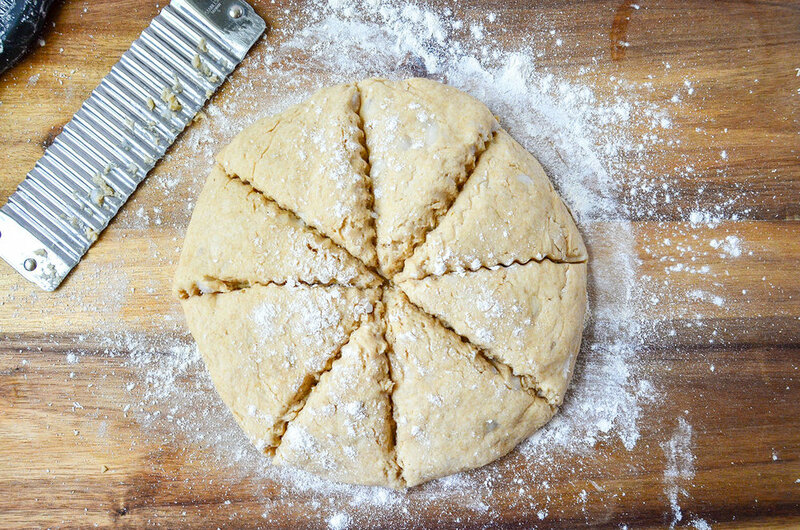 Add the small cubed coconut oil and cut into the pastry using your hands or two knives moving in opposite directions resulting in a crumbly dough mixture. Transfer the dough to a lightly floured surface and form into a circle just under 1-inch thick. Cut into 8 wedges and transfer them to the parchment lined baking sheet. Brush the tops of each scone with the lavender milk mixture and sprinkle with pink organic cane sugar. Bake for about 20-25 minutes until the scones rise and turn golden brown. Remove from the oven and place on a cooling rack to cool. 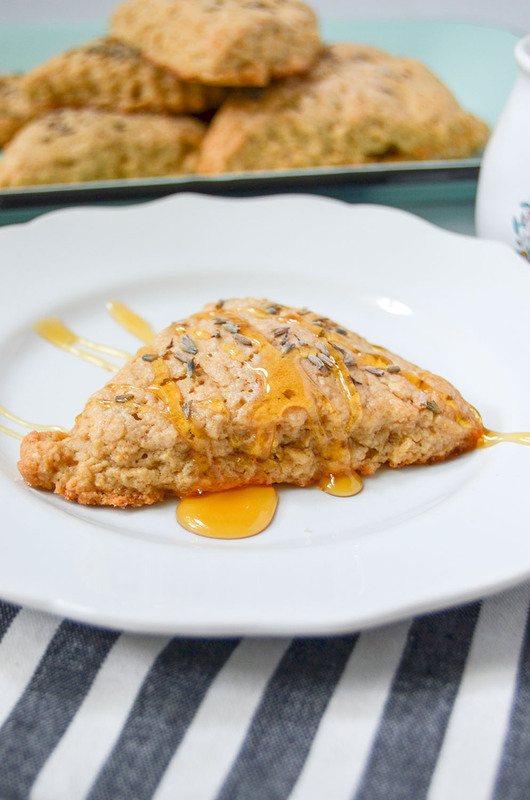 Once scones have cooled, eat right away or drizzle honey over them and enjoy! To a Vitamix blender or milk frother, add 8 oz hot coffee, 1-2 Tbsp lavender milk mixture, and 1-2 Tbsp honey or maple syrup. Blend until fully incorporated, showing signs of milk froth. Enjoy right away with a scone or two! I prefer making the lavender coconut milk mixture a day before and keeping it in the fridge until I am ready to make the scones. It’s best to have the milk on the cooler side as coconut oil melts very quickly. Must use cold coconut oil because if the oil melts when kneading the dough then your scones will be very hard and dry.